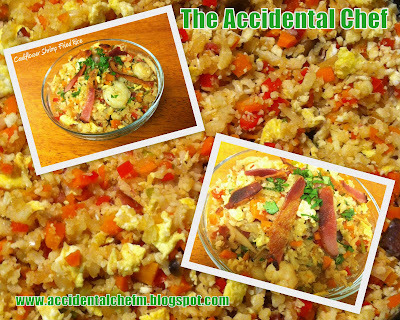 The Accidental Chef: Cauliflower Fried Rice! I am so excited to share this with all of you... 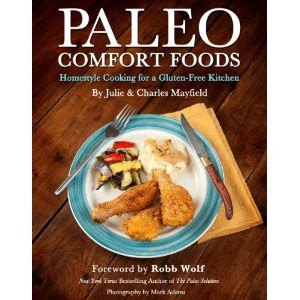 I had found this recipe last week on my favorite blog to stalk, Nom Nom Paleo. I then chopped all of my ingredients and put them in different sized dishes. Having OCD helps in this process... I need to have everything in order and ready before I start actually cooking. Let's get cooking!... 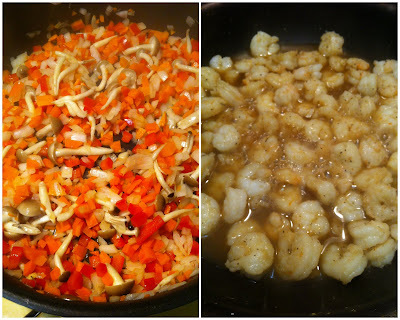 Combine chopped onions, red peppers, carrots, a dash of salt and pepper in a non-stick pan. (A wok is definitely on my wishlist after this asian inspired dish!) Once the onions were softened, I tossed in the wild mushrooms and stir fried everything until the mushrooms were browned. 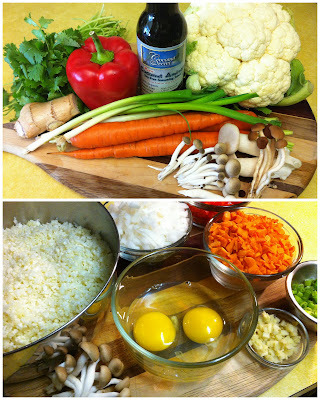 This recipe was so delicious and you don't even miss the rice... Another fun fact is that this recipe is only 192 calories per serving and 100% paleo. It is a great way to get kids to eat their vegetables and they won't even know they are doing it! Thank you Ismael... Let me know when you try it... I will feature a special rum salad for you soon...LOL! That is great to hear!! Sooo happy you enjoyed it. Can you tell me how many carbs? I made this and it was delicious! I only added chicken though because I'm allergic to shrimp. I also didn't put any pepper because I just don't like pepper. And I forgot to add the ginger because I left it in the bottom of my shopping bag!! I added extra cilantro because I love cilantro, and i used crimini mushrooms. Lots of errors and changes :p, but still delicious! :) Thanks for sharing!! I did not see bacon listed in the ingredients?? The shrimp is missing from the ingredient list of your recipe and Nom Nom Paleo. Looks good. Going to try this. Where do you add the ginger? This was delicious! Loved the cauliflower rice! Thanks. I tried this for the first time today and I can honestly say that while it does not taste like rice, i enjoyed it. I was wondering if i should strain the cauliflower in a cloth before adding it to the rest of the ingredients??? It just seemed like there was a lot of extra moisture. I didn't see the bacon in your list of ingredients. I was skeptic to try because I didnt care for a recipe I found using cauliflower for a pizza crust..but had leftover grated califlower that I didnt want to go to waste. I am so happy with this,,it is awsome,,very very good! I even modified some of it and used as a stuffing for green peppers in the oven now! Thank you for the recipe! I made this for my family tonight. They are really skeptical about trying new things. I did not tell them it had cauliflower in it until after we had finished dinner and they all had 2 helpings!!! They loved it!!! Will definitely be a repeat meal for us. how long do u actually cook the cauliflower? does it have to be soft or tender or still kinda crips and crunchy? can i boil it before adding it to the fried rice? wld that work? Don't you need to scramble the eggs before adding?